The Rafu Shimpo is currently running a series of articles about the Wakamatsu Colony, the first Japanese American settlement in North America. Ahead of Part 3 of this series, we explore a 1916 newspaper story written by Bunjiro Takeda that introduced the history of those early Japanese settlers, one of whom was a woman named Okei. At a time that saw the Japanese American community suffering under a strong anti-Japanese sentiment, this article introduced them to the pioneers who had come to America many years earlier. The Wakamatsu Colony, born of the dreams and labor of the new immigrants, collapsed in only two years. One of the members of the group – a young woman whose first name was Okei – was taken in by a local farming family named Veerkamp. As described in a previous installment in this series, Okei came from the town of Aizu Wakamatsu at the age of 17. Her life in California was cut short when she fell suddenly ill and died in 1871. She was only 19 years old. Okei is believed to be the first Japanese woman to be buried on the American mainland, and her gravesite remains on a hilltop in the El Dorado County town of Gold Hill. For years after her death, her final resting place received few if any visitors. Her gravestone was set looking toward of her hometown, on the knoll where she often gazed in that direction during her life in America. Time passed and many immigrants came to California from Japan, however, few of them knew that there had been a Japanese colony in Gold Hill. The existence of Okei seemed to have been completely forgotten. Eventually, time came when the silence was broken. 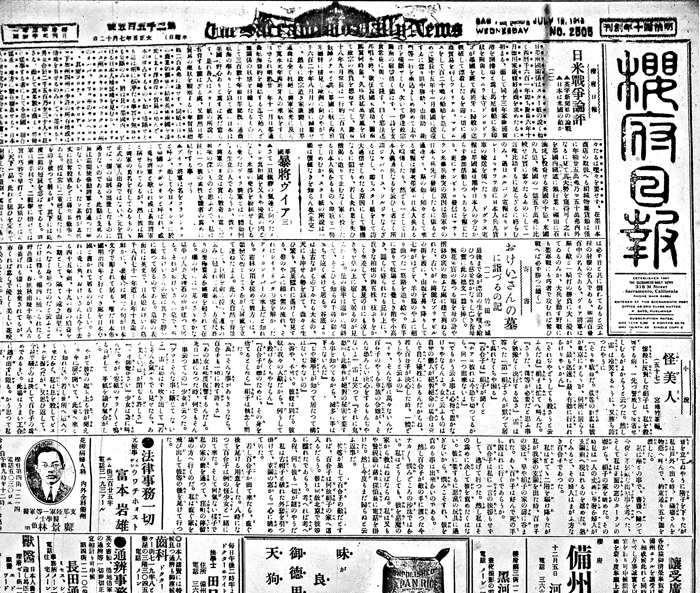 In July 1916, writer Bunjiro Takeda, composed a story for the Sacramento-based Oufu Nippo, or Sacramento Daily News about Okei and her burial site. Having also written under the pen name Setsujyo Takeda, he is now considered the person who introduced the story of Okei to a worldwide audience. Part 2 of the The Rafu series, published on Feb. 2 this year, took an expanded look at Takeda’s article. A Nichibei Shinbun story dated July 12, 1924 said, “Eight years have passed since I wrote about Okei’s grave and introduced her to the outside world. When I went to her gravesite, it was July 4th.” The writer of this piece is believed to be Takeda, referring to his own 1916 article. 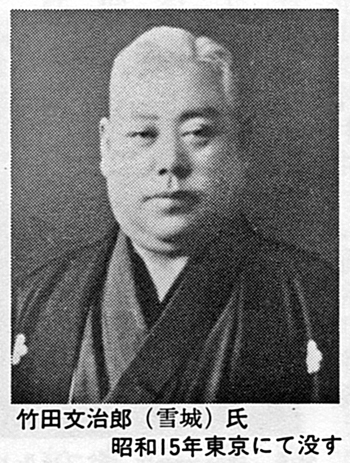 According to The Rafu’s research, in Takeda’s serialized article in Nichibei Shinbun dated June 10, 1932, he mentioned, “I had a relationship with Oufu Nippo.” Having contributed to more than one newspaper has resulted in difficulty for researchers and historians tracing his work. For this series, The Rafu contacted the Research Group for 150 Years of Transpacific Migration from Japan. With their cooperation, we are able to introduce Takeda’s first article about Okei, published in 1916. About half a century after Okei’s death, her story was revealed to the world. Among the details in the story is a description of where the grave was located, noting a rose plant that bloomed each spring. Bunjiro Takeda’s article “A Pilgrimage to Okei-san’s Grave” published in four parts starting July 12, 1916. For his piece, Takeda interviewed an elderly man living near the gravesite. He is believed to be Henry Veerkamp, the oldest son of the Veerkamp family, who welcomed Okei into their home, accepting her as a family member after the Wakamatsu Colony failed. Veerkamp told Takeda the story of a man named Schnell who came to Gold Hill with Japanese immigrants, and had tried to cultivate tea and silk. This man also recalled his memories of colony members named Matsunosuke, Kunigoro and Shinnojyo. Takeda pondered whether these people were still alive, and prayed for the soul of Okei, who died in America at a young age. The article created a sensation in the Nikkei community, instilling pride in the Wakamatsu pioneers, and many Issei visited Okei’s gravesite to mourn for her. This part of The Rafu’s series was made possible with the generous assistance and cooperation of: Aizu Wakamatsu City Library; City of Aizu Wakamatsu; Hoji Shinbun Digital Collection Hoover Institution Library & Archives; Ichiyo Yamamoto, “Wakamatsu Koronī no Ato o Tazunete”; UCLA, Southern Regional Library Facility; and the Research Group for 150 Years of Transpacific Migration from Japan (Masako Iino, Tomomi Iino, Tomoko Ozawa, Michiyo Kitawaki, Teruko Kumei, Miya Suga-Shichinohe, Hisami Hasegawa).